Gordon Swenson bought his first two sheep when he was in fourth grade and learned the hard way how to care for their wool. Over the years, the 71-year-old Petaluma native has revised his method, but it remains uniquely his. That skill has done him well over the years, earning him a cameo in a TV miniseries and this year taking him to the World Series of sheep shearing in New Zealand. But most of all, it has provided him with the means to an end. After he had mastered the challenge, Swenson realized the skill was a money-maker. While he likes sheep well enough, Swenson said, he doesn’t like to shear them. What he did like was the money, because he knew he wanted to buy a farm. Between what he earned shearing and what he later made in construction, by the time he was 26 he had that farm, out at the eastern end of the Two Rock Valley. “I love being a farmer and raising sheep,” he said. Another dream, this one occupying a large space on Swenson’s bucket list, was a trip to New Zealand for the Golden Shears competition, the most prestigious championships in the world of sheep shearing. Swenson learned about it more than 30 years ago. Swenson had planned to compete in the Senior division, not knowing that “senior” has a different meaning in New Zealand. Rather than over 65 years old, it means the most competent, skilled shearers: men with the maximum arm, leg and back strength. 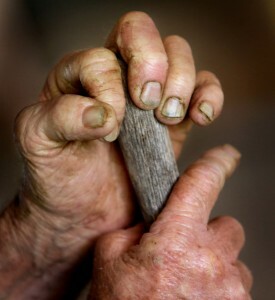 Shearing is back-breaking labor, Swenson said, demonstrating how a sheep must be held between the shearers’ legs. By the time they reach 30, “that’s old,” he said. A certain style is required to shear sheep efficiently. Event management folks suggested he enter in the Veterans division, which is held every other year; but rather than returning next year, the Swensons just watched and enjoyed the week-long competition, then vacationed for a few more weeks before returning to Petaluma. “Not many people can say they’ve lived their dream, but I can,” he said. “This is what I wanted, and I got it by working hard, and shearing was a big part of it. I enjoy working on this place. It never gets old. 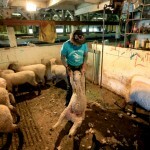 Gordon Swenson prepares another sheep for its shearing. 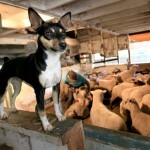 Middle Two Rock “sheep dog” stands guard while Gordon Swenson shears sheep.